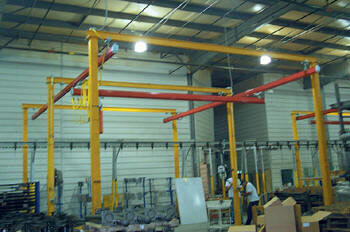 Aluminum gantry cranes offer the benefits of mobility and minimized accessories. Because aluminum gantry cranes feature pinned connections, there are no bolts or riveting required for assembly. A single person can assemble and dissemble these cranes and carry them with a two-strap harness that fits across the back. It is not necessary to utilize hoists and fork trucks, so these cranes are ideal for companies with minimum equipment budgets. Aluminum gantry cranes weigh less than other materials but offer sturdiness and impressive weight capacity. Work area portable gantry cranes feature lightweight mobility ideal for light-lifting applications. Featuring four polyurethane-on-steel swivel casters, work area gantry frames consist of solid welded steel construction and a straddle width and base that measure 68" and are sealed with a powder coat finish. Hoists and trolleys can be ordered separately. 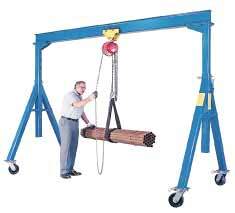 For transporting and positioning heavy materials, use steel gantry cranes from Easy Rack. Available in a variety of sizes, the solid steel construction provides a reliable material-handling tool built for optimal equipment lifespan. Steel gantry cranes move easily across floor space on 8" diameter locking phenoloic roller bearing casters. Easy Rack also supplies and optional lever ratchet that enables quick, one-person height adjustment. When working handling materials in work cells and work areas, use Easy Racks mini overhead cantilever jib cranes to get the job done more safely and in less time. The unique design of the cantilever jib crane allows for outriggers to be mounted underneath a workbench. Workers can then lift materials quickly and safely to the workbench from a cart. Easy Rack also supplies these carts, along with hoist and trolleys, so you can obtain the maximum efficiency on a single purchase order to us. The cantilever jib features a straddle with of 48" and consists of tough stainless steel construction with a blue powder coat finish. For multi-application needs Easy Rack carries both extra travel tri-post jib cranes and floor mounted jib cranes. The extra travel jib features side posts that straddle the worktable and enable workers to pass materials over the work area. Workers can also mount the legs in front of the worktable and overhead beam cantilever products over the worktable. When personnel require 360 degree rotation to maximize workspace, use the floor mounted jib crane. Featuring solid steel construction and 70" usable length I-beam, this jib will help workers safely and quickly lift awkwardly sized materials. The floor mounted jib crane comes with reinforced concrete pads for sturdy installation. To protect workers from injuries when working near low ceilings, Easy Rack furnishes wall jibs designed to lift awkward materials with true vertical wall mounting capability. We also furnish stainless steel tie rod jib cranes that mount to walls or columns in exceptionally high ceilings and features hook coverage and features 180 degree rotation. For material handling performed from the back of pickups, Easy Rack recommends the WTJ-2 jib crane. With a load lift of up to 1,000 pounds, it will lift items from ground to truck bed height and rotate them over the cargo area. It includes a telescopic boom design and manual hydraulic hand pump that pivots the boom up and down. Accessories included in purchase are one grab hook, one chain slot lock, and one sling hook with latch. This jib crane measures 56" in height and swivels on a 360 degree 12" base. The WTJ-2 features welded steel construction and is painted yellow for safety. We also furnish a number of specialty jib cranes for specialized applications. The Air Balancer handles heavy materials easily and safely by means of a push-button controlled pneumatic cylinder. The multi-station transportable jib crane can be moved between different base sockets (one included) to enable use in multiple locations. The portable jib crane is ideal for transportation with a fork truck. It comes completely unassembled and includes instructions for filling the base with concrete upon assembly. Easy Rack carries a wide variety of commercial shelving, material handling equipment, commercial lighting, used pallet racks, commercial christmas lighting and modular prefab buildings installed nationwide. If you can not find what you are looking for call us toll free at 1-888-776-3720 and we will find it for you. Our home office is located in Houston, Texas with regional distribution centers located in all 50 States including New York NY, Los Angeles CA, Miami, FL. Chicago, IL. Denver CO., Dallas TX, San Antonio, TX, Austin, TX. Loading Dock Equipment, Drum Handling Equipment, Fork Truck Attachments, Gantry & Jib Cranes, Industrial Digital Floor Scales, Industrial Fans, Heaters & Blowers, Industrial ladders, Loading Dock Equipment, Miscellaneous Material Handling Equipment, Packaging Equipment, Pallet Trucks & Pallet Jacks, Scissor Lifts & Work Tables, Steel Dumping Hoppers, Utility Carts, Steel Security Folding Gates. A portable jib is one that you can move with a forklift in order to position your crane closer to the desired work area. The jib is a horizontal boom that is attache to either a wall or a vertical support. The boom supports a movable hoist that is used to lift and move objects. EasyRack offers sales of adjustable gantry cranes. 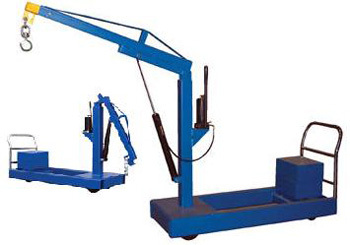 A adjustable crane that lifts uses a hoist fitted to a trolley to lift objects. Floor Cranes. One of the most effective and popular commercial & industrial floor cranes available is the counter balanced floor crane, which is seen in many workplaces around the world as one of the most useful solutions to the problem of moving things around. Because the hydraulic cranes use a fixed system of pipes, constant pressure can be maintained once a part of the system has been moved into place, and this makes them extremely stable in use, and able to support relatively large weights. There are a number of different designs for industrial cranes that are available to include within a modern factory or other facility, and all of them have slightly different purposes in both their design, and their usage. Steel gantry cranes offer great strength, and come in a number of different sizes to provide greater lifting power and flexibility. A bridge crane consists of a large fixed support frame that extends over the entire area that will be accessible to the crane. This framework has two beams suspended from it that act as the rails along which the lifting beam can move. Steel Gantry Cranes. Thanks to their stable and functional design, the use of hard wearing robust materials throughout, and the high power lifting systems that have been integrated into them, these steel gantry cranes offer the perfect lifting solution. Using portable gantry cranes instead of more powerful and costly fixed versions has a number of advantages that makes it a sensible method of operation for businesses of most sizes that are looking for a way to make their internal distribution work better. The Gantry crane is one of the most flexible and important parts of any material handling process. It offers the ability to lift extremely heavy weights, and move them easily from one area to another. Portable jib cranes mean that a single person is able to move a relatively large amount of material within a limited area quite quickly without having to tie up expensive resources such as a fork lift truck for lengthy periods of time. There are various different designs of material handling crane available to carry out different functions. The different models can be mounted in different ways, and can be either fixed or completely portable. There are a number of material benefits of a wall mounted jib crane over other similar alternatives, and these vary between accessibility issues to the level of weight that can be moved, as well as the overall stability offered by the unit when in use as a lifting agent. By investing in a truck crane that can be fitted to vehicles in order to make loading and unloading simple, you can improve your distribution efficiency, and also make life much easier for drivers. An aluminum gantry crane is a convenient and lightweight lifting tool that will allow you to hoist an unwieldy item off the ground and then roll it to another location, or simply suspend it above the ground for examination or repair access.